Waitrose staff in Alcester joined one of the Warwickshire Dementia Friends Sessions held in October to find out a little more about dementia and how they could help in their community and their local store. After the session participants were invited to join members of Alcester Cafe for refreshments. Alcester Cafe is run by volunteers from the local community and supports people with memory problems, people with dementia, their carers, family and friends. It is a free service and the cafe is open 10.30am-12.30pm Tuesdays and Fridays at Jubilee Hall. off St Faiths Road. For more information about the cafe contact Carole 01789 488088. Dementia Friends is an initiative led by the Alzheimer’s Society based on the principle that people with dementia can live well with a little help from other people. Becoming a Dementia Friend is about understanding a bit more about dementia and the small things that can help people live well with dementia. You don’t need to already know someone with dementia to become a Dementia Friend. 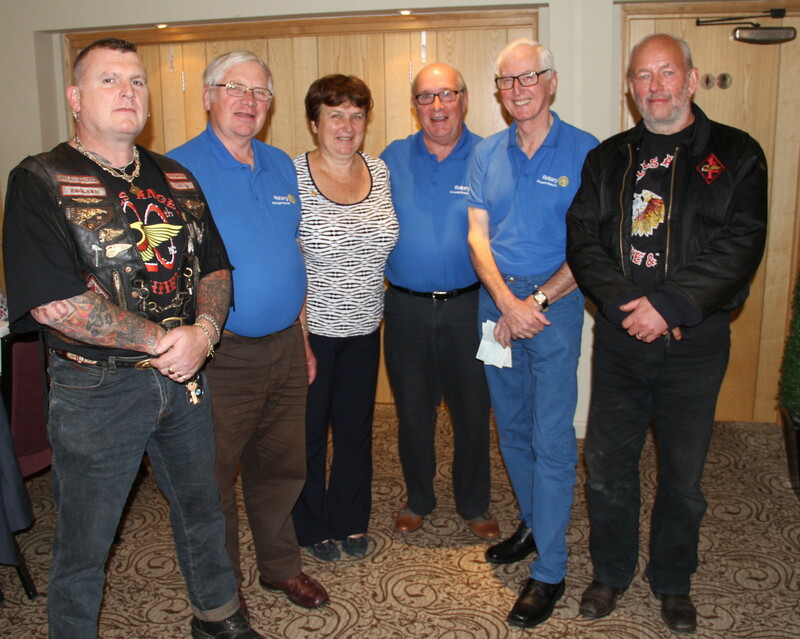 At their breakfast meeting Rotary Club of Alcester Alauna president Alan Mathewman presented a cheque for £750, raised at the Bulldog Bash, to Carole Zambonini. The money will go towards the starting of a day care centre for dementia in Alcester. An additional £250 was given by Hells Angels representatives. The day centre is a follow on from the successful memory cafe, Alcester Cafe, which runs Tuesdays and Fridays 10.30-12.30pm in Jubilee Hall. The day centre committee are trying to find a suitable site in Alcester to start looking after people with dementia and provide carers with some respite. If you want to find out more about the proposed day care or would like to help please contact Carole 01789 488088. People with dementia often say that following the diagnosis they lose the confidence to socialise. Family members often feel left out and experience social isolation, due to the impact that the caring role has on their time and relationships. Dementia cafés are drop-in centres offering a friendly and safe environment, where people living with dementia, and their family and friends, can come to meet others who are in the same boat, have a chat over a cup of coffee, share experiences and information, and learn about support available in their local communities. Dementia cafés offer sessions with speakers from a range of organisations covering a variety of topics that help to support individuals living with dementia, their spouses, partners or children. The cafés can also provide a range of fun activities including singing and playing games from the past. To find a dementia café that is local to you please visits Warwickshire Directory of services. Below is also a list of local dementia cafés, and contact details for any enquiries. Contact: Mike Strophair on 07803729894 or the WRAP office on 01789 778431. Supporting people with dementia in a caring environment. Booking required. Thursday Together: a social evening for people with dementia and those who support and care for them. We meet from 6.30pm till 8.30pm on the second Thursday of the month at the Garden Gate, 44 Regent Street, Rugby, CV21 2PS. First Friday Together runs from 10.30am to 12 noon on the first Friday of the month at the Claremont Centre, 43 Clifton Rd, Rugby, CV21 3QE. For those caring for someone now in residential care: From 9.30am till 10.30am on the first Friday of the month at Claremont there is a meeting for those caring for someone now in residential care to share and support each other. Bereaved Support Group: a monthly meeting for coffee/tea and sometimes lunch as well. This group is for people who have been bereaved following caring for a person close to them who had dementia and would like support and an opportunity to share experiences, and for companionship. 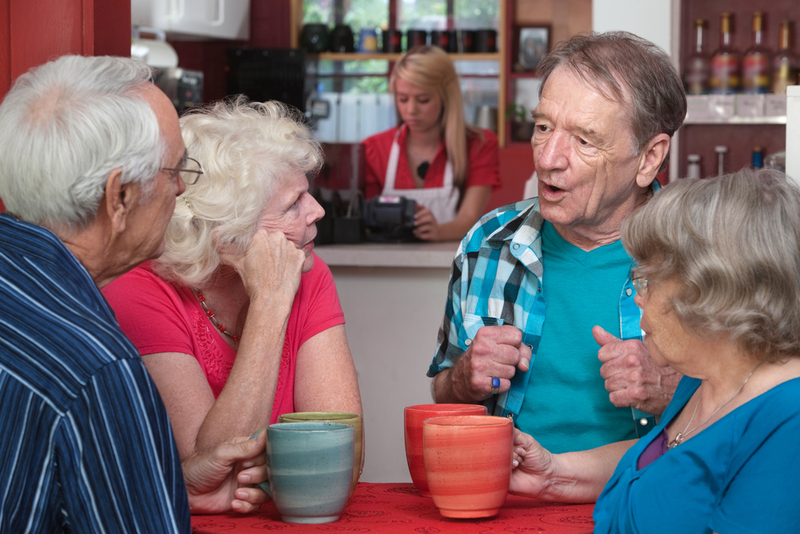 Dementia café offers good social interaction. The café is a very good resource of information and is very supportive.